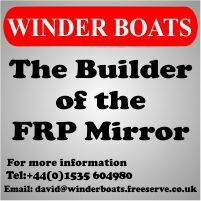 With the Mirror's deep cockpit, decks below gunwale level and (normally) ineffective transom scuppers, any water splashing up and into the boat generally ends up in the bottom of the cockpit, so self bailers (venturi in AUS), which bail water out of the boat as it sails along, are a common optional extra amoung racers and appeared in spares and optional extras leaflets from 1980 at least. The Sea-Sure Supersuck is a clever design using Bernoulli's principle with a wing section in the bottom of the bailer to generate the low pressure. Guy Wilkins had a Supersuck in 67008 - Salami Tactics (see page 34 of Guy's book Mirror Racing). 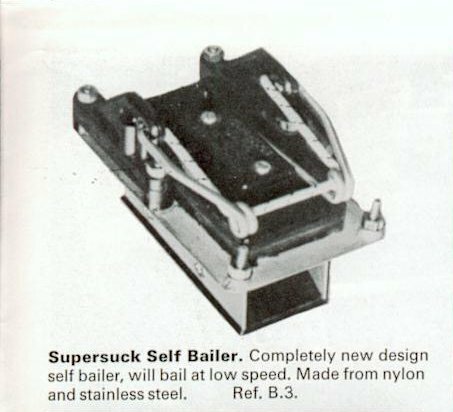 I used Supersuck bailers for many years and they do start bailing at a lower speed than an Elvstrom/Andersen bailer. However there are some disadvantages with this design. Prone to damage when launching and recovering the dinghy. No non return flap, so if you leave the bailer down, and sail slowly, your boat fills up with water, not ideal. Prone to leak when up. Designed by Danish Olympic sailor Paul Elvstrøm, this features a wedge shaped venturi that closes automatically if the boat grounds or hits an obstruction, and a flap that acts as a non return valve to minimise water coming in if the boat is stationary or moving too slowly for the device to work. These bailers are now marketed under the Andersen brand. They don't start bailing at lower speeds like the Supersuck, but they overcome nearly all the other problems. Note that they are still prone to damage if you launch your boat with the bailer down (they will catch on the trolley and end up getting bent and then they don't seal properly and leak). However, it's fairly easy to avoid this pitfall, and even if the bailer gets bent, it's normally a few minutes work with a pair of pliers to bend it back into shape so it seals properly. They come with a plastic mesh over the bailer opening. This is a good idea, it stops the end of halyards or control lines going down the bailer, from where the non-return flap makes getting the line back out pretty hard. Andersens are the standard self-bailers on a Winder. 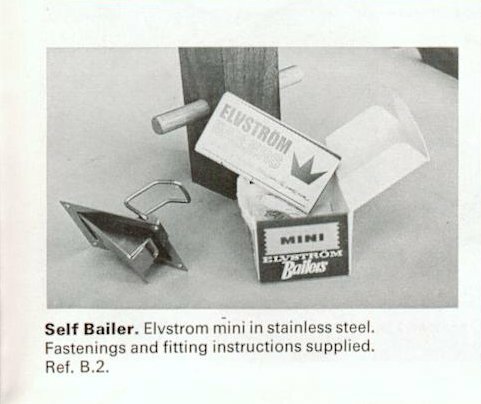 Holt Allen/Allen Brothers make a plastic self-bailer, a bit like an Andersen, but without the non-return flap. They don't look anything like as robust as an Andersen. I've never tried one, and have no plans to do so. Both the Supersuck and the Elvstrom/Andersen are availble in two versions, external fitting and internal fitting. The external fitting version has a stainless steel flange that fits on the outside of the hull. Normally a shallow (1-2mm) recess is cut around the bailer hole, into the outer layer of ply/GRP so the flange lies flush with the hull. 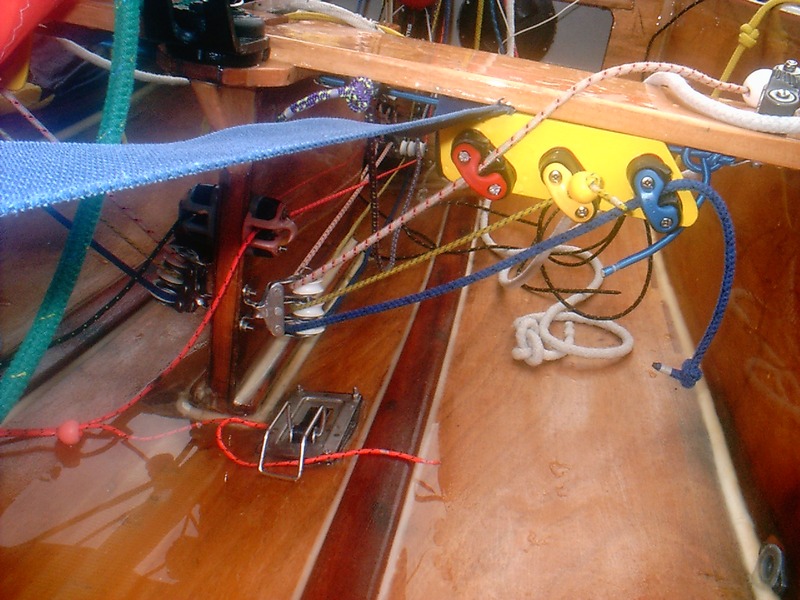 Some people think this weakens the hull (which on a wood boat is only 5mm ply). It also makes it harder to remove the complete bailer for maintenance since any fairing and filling around the flange has to be removed. On the Andersen, the 'chute' part of the bailer can be removed for maintenance with the flange part still fitted to the hull, which is a help. I find the external Andersens wear in time, so they won't stay down by themselves (you have to keep your foot on them). The internal fitting version has a flange that fits inside of the hull. There is no recess, so less weakening. It also means it's easier to remove the complete bailer - you just remove the nuts and washers and take the whole unit out. I use internal fitting bailers and on my boats the bolts remain permanently glued in place. The disadvantage of this version is that the flange inside the hull stops the last bit of water from reaching the bailer. 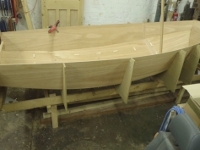 Needless to say, the self bailer needs to be fitted on a flat, or near flat surface, where the water gathers, so on a Mirror, this is around the aft end of the daggerboard case. I recommend painting/varnishing the hole and recess carefully and using a clear silicon (i.e. bathroom) sealer around the bailer, as well as any rubber seals provided, when you fit it, to stop leaks. When you boat put you boat in the dinghy park after sailing, I recommend you chock the boat level and leave the self-bailer down, so most of the water, that gets past your boat cover, drains out. Don't forget to pull the bailer up before launching. Given that the cockpit floor is subject to water lying on it when the boat is not being used, I like to take the bailer out each year and check the varnish and/or paint around the hole is intact and water is not getting into the hull structure. I also clean the bailer, removing any sand etc. and apply silicon grease to the rubber gasket and moving parts. Gasket replacement kits are available for both types.